Last year we had the privilege to review Logic of English Foundations A which I used with both Bee and Tiger. This year we were able to continue the program as I was asked to review Foundations B from Logic of English. I was so excited to continue building on the skills that they had previously learned! We also had the opportunity to review the Doodling Dragons app for iPad. Logic of English was created to teach literacy through phonics instruction that integrates multi-sensory learning. The program includes spelling, reading, and writing instruction as well as grammar. Logic of English teaches the meaning of root words, suffixes, and prefixes in addition to common phonograms. 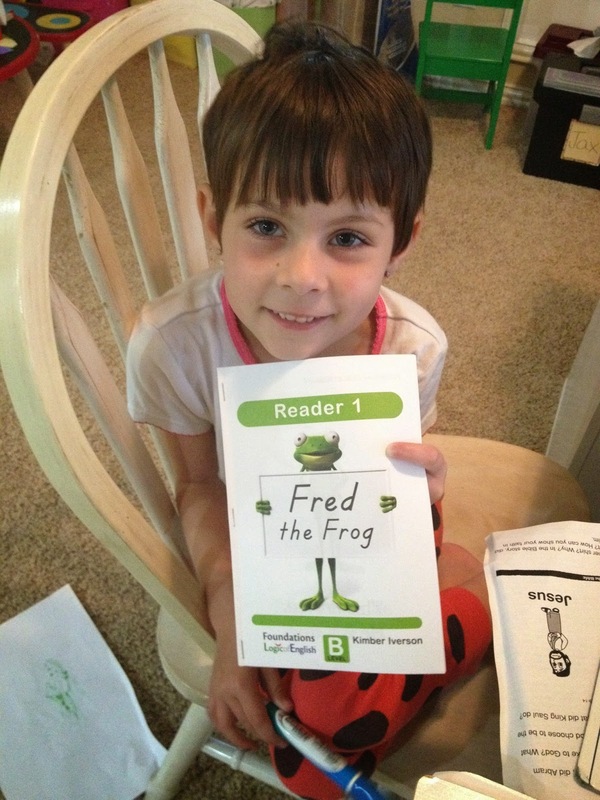 The Foundations program first teaches the skill of reading through understanding phonics rules. This program also introduces handwriting instruction and each level includes spelling word lists and spelling rules. Foundations B introduces uppercase letters in either manuscript or cursive and continues with reading instruction of words and introduces sentences. This level teaches the long vowel sounds in words to read and spell, as well as numerous new spelling words and 8 spelling rules. The Foundations levels are geared for students between the ages of 4-7 who are in various stages of learning to read. The Doodling Dragons app is for kids who are learning letter sounds. It has 3 components. First, you can listen to each letter read with all the various sounds. Examples of short words or phrases that use those sounds are also given. (Ohh, and these are read by Jim Weiss who is my kids’ favorite storyteller!) The second part of the app lets you play a simple phonemic awareness game. A letter is given and words are said that begin with that letter. The child must then select the correct picture to correspond with the words. The last component of the app is the learning section. The child can choose any letter of the alphabet and hear the sounds read aloud to him. The app is geared for kids ages 2-7. I used Foundations B with both Tiger (age 6) and Bee (age 5). I used the cursive workbook and both of my children began learning the uppercase cursive letters (after learning all the lower case letters in Foundations A). With Tiger, we worked through more than one section of a lesson each day. This allowed him to complete several lessons per week. We also played the numerous games and spent lots of time reviewing phonograms and with handwriting practice. With Bee, we covered only 1 or 2 of the lesson sections per day. She usually only completed 1 or 2 lessons per week. Bee spent much of her lesson time practicing phonograms and sounding out words. We also worked on all the spelling sections together. Phonemic Awareness – This section teaches syllables and how to break words into pieces for easier decoding. It also introduces rhyming and the long and short vowel sounds. Phonogram Spelling Rule – A new phonogram is introduced or old phonograms are practiced. In some lessons, a spelling rule is taught and practiced. Handwriting – In this section one new uppercase letter is taught in each lesson. Spelling – Spelling rules and phonograms are practiced with a list of 5 spelling words each lesson. Reading – Reading skills are practiced through short readers included with the program or games to practice reading high frequency words or sight words. Every sixth lesson is a review lesson that reviews the skills taught in the previous 5 lessons. I introduced the new phonogram for this lesson which was “er.” We each practiced writing it on our whiteboard in cursive. Then we compared the phonograms “r” and “er” and talked about how the sounds were different. Next we played phonogram “Go Fish” in which we tried to find matching phonogram cards. After our game I taught Tiger how to write a capital “R.” We practiced the letter numerous times on the whiteboard and then wrote all the uppercase letters he knew for a review. Then we used our workbook and I read a phonogram to Tiger. He had to find the matching phonogram on his workbook page and circle it. The next portion of the lesson was phonemic awareness where we reviewed what a syllable meant. I said numerous words from the word list to Tiger and he told me how many syllables were in each. Then we worked on spelling. I first had him review lower case letters in cursive and then I gave him the five spelling words that he wrote on his whiteboard. The last section of the lesson is the reading section. In this section I cut out a list of high frequency words from his workbook and folded each one in half. I put them all in a bag and let him draw one at a time. He read the word to me and then crumpled the paper and tried to shoot it into the trash can for a game of basketball. We began the lesson by learning a new phonogram “th.” We practiced saying it correctly, noting that our tongue had to come between our teeth to say the phonogram. Then we reviewed all the phonograms with Bee as the teacher. She held up each card and I said the phonogram (usually incorrectly) so she could “buzz” me and have me try again. She thought this was great fun! Next we practiced uppercase handwriting with the letter “T.” We then reviewed the other uppercase letter that she had learned. In the workbook, she matched the handwritten and bookface letter to practice recognizing the different ways of writing each letter. On the next day, we reviewed the meaning of a vowel and consonant and I introduced the definition of a syllable. We practiced counting syllables by placing our hand under our chin and feeling how many times our mouths opened while saying each word in a list of words. Then Bee had to tell me how many syllables were in each word. The next section was the spelling section. Bee practiced writing lowercase letters before I gave her each of the 5 words on the list. We sounded out each word together as she wrote down each letter. On the third day, we reviewed the new uppercase letter we had learned as well as the new phonogram. We practiced writing both uppercase and lowercase letters and then we finished the lesson by completing the reading section. This lesson had a list of high frequency words to cut out. I set a time for 2 minutes and placed them face down in a pile. I had her grab one at a time and read it aloud before the timer finished to see how many words she could complete. We did this several times to see how many words she could read before the timer beeped. I told Ladybug (age 3) that the app was for her! She was thrilled that she had her own learning game on the iPad and she enjoyed hearing the letter sounds and trying to match the correct picture with the words. Bee also used the app during rest time to practice her phonogram sounds. She enjoyed having the letter book read to her as she listened to all the sounds. Tiger used the app sparingly as he already has a good grasp of the letter sounds. He’s now working on the more complicated phonograms. I really enjoy this program. I love how easy it is to use with the clear teacher’s manual, all the game ideas, the teaching tips, the help for students with speech issues, the colorful layout, and the scripted sections to guide me as I teach. It is a program that can be truly open-and-go with no advance planning required. I have enjoyed how spelling, reading, writing, and grammar are integrated into one program. Each lesson teaches one skill in each of the subject areas and builds incrementally throughout the program. The pace of the program is very flexible and it contains excellent review. It is easy to break up the lessons because each lesson is already in small sections of subtopics. This allowed me to easily find stopping points in the lesson if my children needed a break. Or if Tiger was understanding the concepts well we could simply continue and finish the entire lesson. With a review lesson after every 5 lessons, it was easy to assess how well my children were retaining what they had learned. The program is very interactive with games for learning phonograms and practicing reading. My children found the games and hands-on aspects to be very motivating and fun. Every lesson feels varied and different and it kept our learning interesting and they were always engaged. The program comes with readers that you can tear out of the book and fold into small booklets. My kids enjoyed creating their own readers. I liked that the readers have a controlled vocabulary so they would not encounter words that they did not have the knowledge to sound out on their own. This eliminated frustration on their part and made the reading fun because they were able to figure out each word on their own. They were so proud to read each reader! I love how they teach handwriting! The instructions are clear and consistent and the handwriting font that is used in the program is a beautiful cursive. My kids have wonderful cursive handwriting thanks to this program! My younger kids (Ladybug age 3 and Bee age 5) really enjoyed the app and it gave them great practice for letter sounds. I liked that it was easy to use and very colorful. It was appealing to my littles but it was simple for them to navigate the app on their own. It was wonderful reinforcement of the phonogram sounds – I especially enjoyed that they could review on their own! And the kids were thrilled when they recognized Jim Weiss’ voice on the letter book. That was such a fun surprise for them! This program is bright, colorful, fun, and engaging for both the teacher and the student. I have found that it makes learning phonograms, reading skills, spelling rules, handwriting, and grammar instruction to be interactive and enjoyable with an incremental approach that contains thorough review. I absolutely love this program and highly recommend it for any type of learner because it is easily adaptable and contains excellent teaching tips and helpful resources for the parent/teacher. We are happily moving forward in the program with Level B and I’m hopeful that we can move into Level C afterward! My kids refer to this program as “dragons” and every day they ask me if it’s time to do reading dragons yet. They look forward to our time with Logic of English! Logic of English Foundations B teacher’s manual can be purchased for $38.00 while the student workbook can be purchased for $18.00. ← Wholly Tired or Holy Tired? Thank you for a thorough review, and telling me exactly where this picks up. I'm trying to decide what to do for Jude and this really helps me make up my mind! You're welcome! I'm so glad it was helpful. It's a great program – very colorful, engaging, and hands-on.